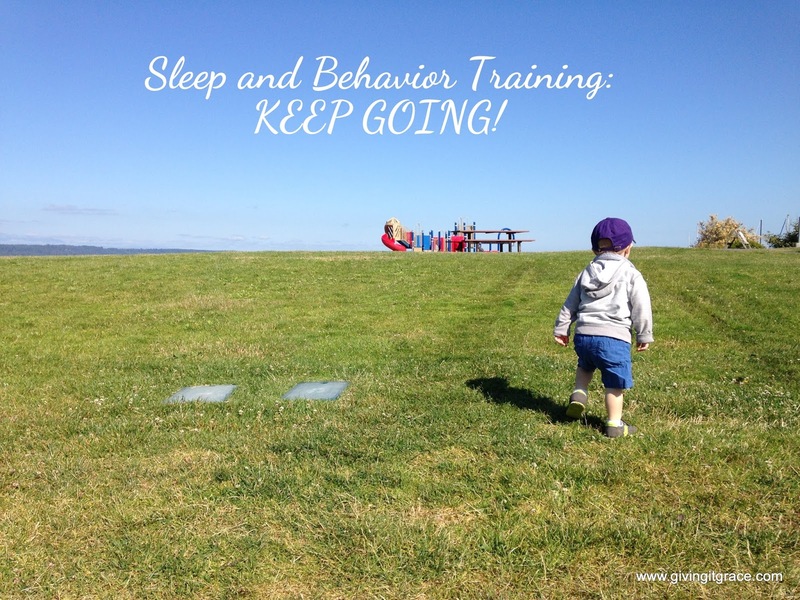 Giving it Grace: Sleep and Behavior Training: KEEP GOING! 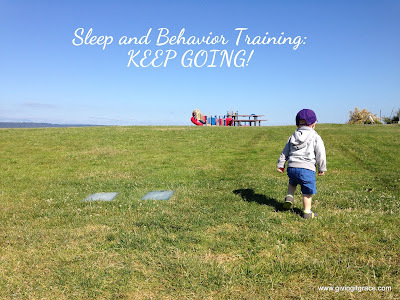 Sleep and Behavior Training: KEEP GOING! Anyone that has even tried to tone up or loose a few pounds knows that it takes time to see results. How silly would it be to expect one time at the gym to produce the results we want to see? Instead, usually the opposite happens – our muscles are fatigued and immediately become sore instead of stronger. Yet what seems like a set back or discouragement is actually the beginning of the process toward the results we are hoping for. We know well enough that if we keep going, our muscles will eventually grow stronger, or that weight will eventually start to come off. The same is true of changing children’s behavior. When baby is little, we spend time and energy trying to alter babies sleep behavior. When baby turns into a toddler, we shift our focus to shaping the child’s awake behavior (obeying, playing well with other kids, etc). There is no magic, one-time solution that makes every baby effortlessly sleep through the night or every toddler obey perfectly every time. When it comes to changing a child’s behavior, you cannot give up after one try or at the first sign of resistance; you have to keep going. Do you see how unreasonable it sounds with the gym analogy? Yet how often do we apply the same unreasonableness to our children's behavior? I've also heard "he just can't be trained, so I gave up". What the parent is really saying there is maybe the child could be trained, but the parent stopped too soon to see any results. This one really grieves me because children are not wild animals, they are people - and what we are training them to do (sleep, behave, etc) are not unreasonable or unattainable goals. Some behaviors may take longer than others to correct (like way, way longer than we would ever expect), but that largely depends on mom and dad’s willingness to stick to it – to keep going. If mom and dad are really, truly working on the shaping the child's behavior over a long period of time, they are going to see some results. Mom and dad also have to be willing to stand firm through the set backs or delays, knowing that you can't expect change without facilitating opportunities for the child to do so. A baby will not likely learn to fall asleep on her own if you never put her down awake; you’ve got to keep giving her opportunities to get the hang of it. Try again next nap…keep going. The first time you introduce a bottle, he might not understand it. Try again tomorrow…keep going. The first time you tell your toddler “no” in a firm voice, he might think it’s funny. Tell him again and make sure he really understands you mean business…keep going. I realize this is not a popular approach to take. It’s much more comforting to hear “he’s just wild and there’s nothing you can do about it”, but I think that’s a really scary place to leave a child. To abandon him in a world where he is in control of everyone per his whims and his big emotions are what rule the family. That's not doing him any favors, and he will be sadly mistaken when he enters into school and learns that he has to have some self control to function alongside his peers. The book of Proverbs (22:6) tell us to "train up a child in the way he should go; even when he is old he will not depart from it". In this directive mom and dad are the coaches, not the dictators. You can’t make a baby sleep or make a child obey by simply commanding it; behaviors and skills must be learned over time. Mom and dad are the coaches that will teach their child, hour by hour, day by day, opportunity by opportunity. Failures are to be seen as opportunities to reinforce whatever it is you are trying to teach. If you don’t provide the opportunity to learn, they certainly will never get there. On a practical note, I think the idea to keep going is most important when sleep training because that’s when a mom is most likely to be looking for a magical quick fix. When no quick fix shows up, we start asking other moms what ultimately worked for their little ones. When those things don’t immediately work for our child, we get discouraged. But this is the place I really urge new moms to keep going. Now I do understand there are some things you child won’t respond well to. Sometimes kids get stuck in a rut and just have a mental block. This can happen in physical training, too: runners can plateau, the weight loss will stall off, etc. In those scenarios, the advice given is to mix up the work out: run in a different location, try a challenge, do a different exercise, etc. Similar to this idea, I do have one trick that I pull out when I’m at a road block with my toddler's behavior and you can read about it here: One Quick Trick to Stop Unwanted Toddler Behavior. I would say this "trick" also works with baby's sleep training: if mom and baby are having a rough week of sleep training, my first piece of advice is for mom and baby to pack up and head out of the house for the day. Let baby nap in the car seat or in a carrier. This change of pace is often just what mom and baby need to start fresh again the next day. With any child, whatever the age, the coaching process is a give and take, it works best if you are coaching your child into a direction that works well with their personality and more importantly, their current abilities and needs. I love this Steph! It can be really hard and frustrating to feel like you are failing when it doesn't just work right away, but I have found that consistency (with everything) is so so important for babies and toddlers. It can be hard to always stand the line or keep going but it works eventually! Great post!